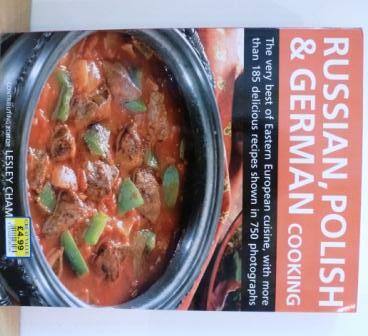 Blurb: “The first full-colour, truly comprehensive collection of Eastern European recipes”. I’ll be honest I’m not sure why I bought this book! It was a random purchase from a garden centre. It may have been the promise of Romanian recipes, I taught English there for two summers and have very fond memories, but it turns out there are only really two recipes from Romania. The rest have very little information about their heritage, although it is spilt into chapters for each country or area. That said it is a book about cooking not culture, history or anthropology and a £4.99 maybe you get what you pay for. Disappointed, less than enamoured by the dated looking photography and falling into the trap of assuming everything would be heavy and potato based this book languished on the shelf. 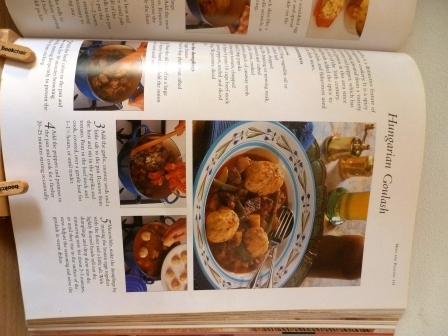 It has been cold this week and The Man said he would like something hearty and warming so this book finally had it’s chance to impress with Hungarian Goulash. 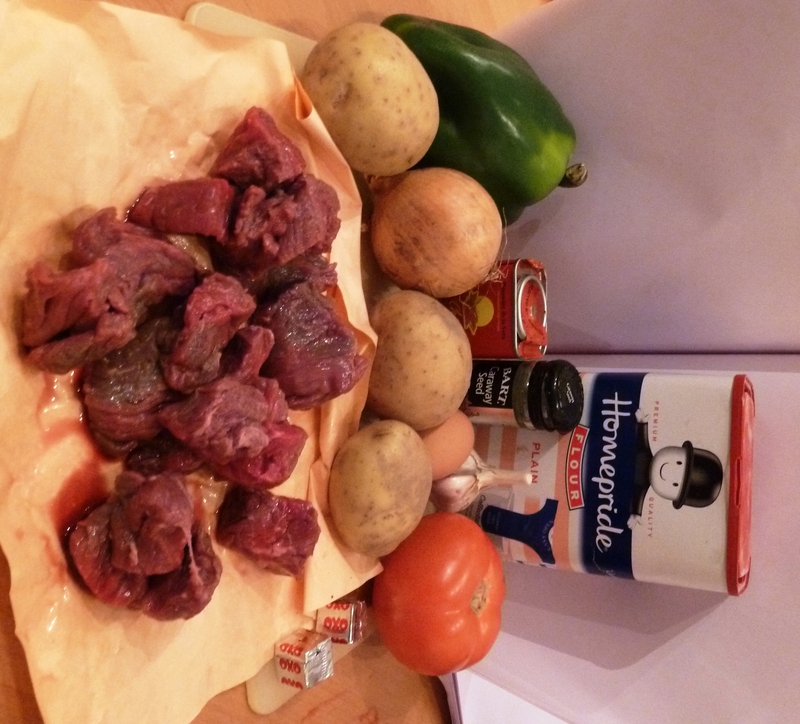 The recipe has a simple list of ingredients, only specifying that beef should be used, Lamb makes it a different type of goulash and flour should not be used so the finished dish is a thin stew and any thickness coming from the potato breaking down. The recipe instructions were clear and simple but didn’t give too much guidance e.g chopped onions leaves a lot of room for interpretation but equally creativity and is in keeping with the no frills theme of the rest of the book. The goulash was simple to cook, and didn’t require much attention or stirring etc; although I did fail to judge how much it would make and switched pans. Given my initial scepticism about this book and it’s potential I was really surprised by how tasty this was. Rich, warming and flavoursome, perfect in cold weather and I’d imagine very welcome in the depths of a Hungarian winter. The Man was surprised and impressed too. The only let down for me were the dumplings, yes that’s what you can see floating in there. I raised my eyebrows at these from the start as they only contain plain flour and egg, no seasoning or additional flavour. I found them chewy and gluey and lacking in flavour. Rib sticking? Yes, tasty ? No! Perhaps if I’d made them smaller, like very small pasta it would have been better but I’d leave them out next time. 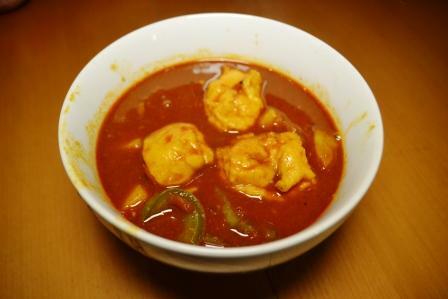 Cook it again: Yes and there are a couple of puddings I’d like to make including sweet cheese dumplings but I have a feeling it will be a while before I do.